A tidily made, good-sounding acoustic with an excellent pickup/preamp system. What's not to like? Great tones both plugged and unplugged. Solid, neat build quality. Good value. Chunky tuners. High string grooves. Alvarez is having a well-deserved renaissance after the American-owned brand was reimagined in 2012. There's a comprehensive range of Chinese-made guitars currently available that kick off just under £200 and move up to the loftier heights of the Masterworks series, which retail between £559 and £899. It's from this series that our review model, the MG75SCE, originates. Time for a closer look. Pulling the MG75SCE from its case, it's clear that while it may be aping Taylor's best-selling body shape, this Alvarez is not only impressively spec'd for its relatively modest price, it's very cleanly put together, too. "This Alvarez is not only impressively spec'd for its relatively modest price, it's very cleanly put together, too"
Inside and out it's hard to find fault. The satin finish is clearly thin and beautifully applied, the maple binding is spotless, and the subtle soundhole rings absolutely razor sharp, just like the interior quarter-sawn spruce bracing and traditionally kerfed linings. The 'one-piece' mahogany neck construction refers to the fact that the headstock is from the same piece as the main neck, not laminated like so many lower-priced guitars; it's correctly quarter-sawn for maximum stiffness and attaches to the body with a traditional dovetail joint. The flat dome heel is a separate piece - nothing wrong with that, of course, nor the chunky old-school depth to the D-shaped profile that might not seem as 'fast' to an electric player, but it gives a sense of purpose and is very comfortable in the hand. Fretting is good, too; the fingerboard edges are actually bound with a separate strip of rosewood so you don't see any fret ends - very typical of modern Chinese craft. The string grooves in bone nut could be a little lower, and with a 35mm string spread it's not the most spacious, but it's perfectly comfortable, especially for strummers. A nicely compensated bone saddle sits atop the 'Bi Level' rosewood bridge with its abalone-dotted ebony pins, which sit in the lower central section. 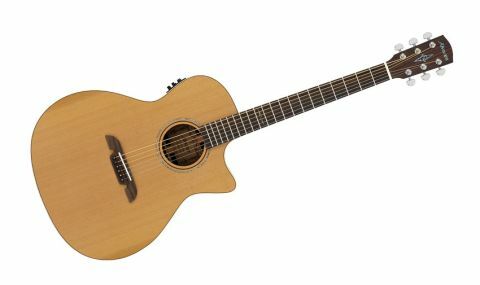 It creates a steep angle for the string behind the saddle and is quite possibly one of the reasons why both our review guitar has a vibrant piano-like ring and sustain. If we're honest, the only thing we'd change are the chunky, electric-like Grover Rotomatic tuners - they're perfectly functional, but seem out of place here. As a stage-intended electro, along with a second strap button, we get the so-called SYS650 preamp that controls a dual pickup system. Aside from the Alvarez logo, it's the standard OEM B-Band T65 made exclusively to be used on guitars like this. While the majority of dual systems involve an under-saddle and an internal mic, here we have a thin UST (under-saddle transducer) and a larger AST (acoustic soundboard transducer) that sits directly under the bridge-plate. Both transducers are made from Emfit ferro- electret film. With a slider mix control, volume, three-band EQ and a notch filer, along with an output-muting chromatic tuner with a clear LCD display, it's a very thorough system. Battery access is on the side by the lower strap button, and we have both an unbalanced standard jack output along with balanced XLR. "The MG75SCE is all about width with generous but not over-egged, lows, crisp highs and a flatter, even midrange"
The MG75SCE is all about width with generous but not over-egged, lows, crisp highs and a flatter, even midrange. As ever, we'd love to hear this after it's been played in a little more, but the MG75SCE is perfect for supplying a wide rhythm bed. The electro performance is well above average and the bass EQ certainly adds a full low depth, but with it comes immense feedback potential. The mid frequency is well aimed, and with some reduction here and a little lift of the treble EQ it's extremely easy to dial in that modern electro scooped zing. The AST pickup on its own gives a paper-y edge and mic-like realism to the electro voice along with an increase in handling noise. The UST is more standard piezo-like with a more direct tone. If you crave a studio-like mic'd sound and can control it, the AST gives a very natural sound on its own, which is great for percussive styles, of course, because it's sensing much more of the top's vibration. At higher volumes, though, it might be too much, and although it seems to have a far higher feedback threshold than most onboard mic systems, less is definitely recommended. The notch filter is pretty effective, although a phase control would be a handy addition: oddly, in the T65 user manual a phase switch is referred to, though not actually on the preamp. In conclusion, this is a fine guitar for the money with one of the best electro systems we've come across. If you haven't checked it out already, then add Alvarez to your mid-priced electro 'must-try' list.